Having arrived at our hotel in Tiberius (http://royalplaza.co.il/index.php/english) the evening before, it was another early start for a day exploring the region around the Sea of Galilee. We started by visiting the Ancient Boat Museum, where the oldest wooden fishing boat (dated to the first half of the first century) was found and recovered in 1986. This was also the one and only 'tourist shop' that sold polo shirts as well as t-shirts, needless to say I bought a couple! Shanhong also bought a pair of very attractive pendants. Having seen the original 'boat of the time of Jesus' we boarded a much more modern wooden fishing boat for our own trip across the lake. This was perhaps the highlight of the whole trip for me, as the boat is run by a Messianic Jew who has a worship ministry translating popular worship songs into Hebrew as well as writing original material. Hence, we were on the boat, singing praise in English and in Hebrew, in the middle of the Sea of Galilee! 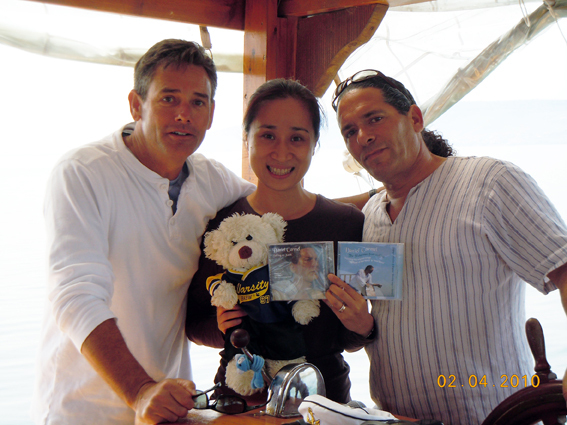 The picture on the left shows Shanhong with Bob Fitts, our own (American) worship leader, and Daniel Carmen, the boat captain and Israeli worship leader. Yes - we did buy CDs! Details of Daniel's ministry can be found at www.SeaOfGalileeWorshipBoats.com Daniel's music also forms the backing to the photo slideshow available from the homepage here on mrhughes.net. After our boat trip we crossed to Capernaum. This town was the centre of Jesus' Galilee ministry after he left Nazareth; a place where he healed the sick, preached in the Synagogue and performed miracles such as the healing of the paralytic that was let down through the roof. We visited remains of a 4th century synagogue believed to have been built by the centurion whose servant Jesus healed, as well as excavations of a property believed to have been the house of Peter. After lunch we went to the Mount of Beatitudes, a hill at the North-Western point of the Sea of Galilee where Jesus is believed to have delivered the famous Sermon on the Mount. The hill has a hollowed slope that serves as a natural amphitheatre, amplifying any speaker's voice. Again, as a special moment - half the group climbed the hill and read the Beatitudes - whilst the other half stayed below to listen. It was obvious that words travelled very easily and you could almost imagine Jesus preaching to the crowds below. A nice slow walk trough the banana plantation brought us back to the road and to Tabgha, the location along the shore of the lake where Jesus called Peter and Andrew to follow Him and become 'fishers of men'. This is also traditionally held to be where the miracles of the loaves and the fishes or the feeding of the 5,000 took place. We went to the Church of St. Peter's Primacy, built to remember the place where the resurrected Jesus showed himself to His disciples as they were fishing, and went on to restore Peter who had denied Him before the crucifixion. As a place of restoration, we gathered as a group to share Communion. The following photos are from Mount Arbel, one of the highest points in Israel, giving panoramic views over the Sea of Galilee and surrounding areas. More to follow!